I'm needing to choose a carpet for 2 bedrooms & some stairs, but I've got no idea of what to look for. What do you think? The walls are going to be white (solver parchment). The rooms are approx 30m2 and there are 16 stairs. I'm hoping to get it done for less than $2000 do you think that's possible? What are the different types? I'm wanting something soft, but isn't too plush. Are there certain ones that are easier to clean spillages etc? If you do a search in the forum, there is a pretty long thread about choosing carpet. Ash (i think code name RoyalBlue) seems to be a carpet guru and I remember reading a very long post of what to look out for and what are the best choices. Check out this link, if this doesn’t help you go through the flooring section there’s lots there for you to read! Always remember to use TOP quality underlay on your stairs, as that is the first place that gets worn down! The quality of underlay you choose will help your carpet last longer. DON’T go for the cheapest! I'm afraid I was away from the forum for a while, and missed your post. I think a DuPont Stainmaster nylon carpet may suit you. You already are having white walls, so go with a colour and tone that you like, but I'd suggest more of a mid-tone carpet. Choose one that has fairly DENSE pile, but NOT too deep. A good quality, firm & dense underlay underneath will give it best service. There are some Stainmaster carpets with subtle geometric designs that I think are more interesting than just plain styles, but that's your choice. Am I too late? (you may have already bought). If so, how did you get on. $2000 might not get you the best carpet for the job. More like $3k I'd say, but sometimes you can get good deals on special that may be within your budget. Ash I have a week before this stuff goes down. I couldn't seem to find the specific carpet from the web-site. Assuming the 20% synthetic is nylon, I'd expect it is pretty good. If the 20% is polypropylene, not so good. The twist pile should give fairly good service. Being predominantly a wool carpet, you should follow care advice from Woolsafe Australia, and choose a Woolsafe certified technician for any professional cleaning. Invest in good, large doormats, and a good upright vacuum cleaner with HEPA filtration (like Dyson). You will initially get a fair amount of loose fibres coming from the carpet. That's normal, just vac it. Keep all hard floors well maintained & clean, to prevent soiling migrating from there onto the carpets. If you have kids & spills are expected, you might benefit from having the carpets protected with 'DuPont Teflon Advanced for Wool'. If so, lay the carpet, and have the carpet cleaned first, then Teflon applied. It is a good way to give your new carpets the best service and performance. Hey Ash, do you recommend foam or rubber underlay? What is better? I generally prefer a rubber u/lay. But there are different options, and they need to be best suited for it's specific application. Bridgestone Gold is a good starting point. In our last place we purchased the Bridgestone blue underlay which was top of the range... It was luxuriously soft underfoot, for sure, but we had cream carpet and it seems no matter how we cleaned the carpet, either steam or dry clean, the stains kept returning. ( Just general dirt from shoes that disappeared once cleaned, but returned in about 2 weeks or so). For the record, the carpet was Godfrey Hirst Cambridge and was about 5 years old. We have been advised that by using foam underlay (which is flat) with a moisture barrier on it, it will stop the residual dirt from being trapped underneath the carpet unlike with the grooves of the rubber underlay. It's hard to know what to believe. Needless to say, we have NOT gone with a cream carpet again especially with kids, but this time we are hopefully going with a 100% wool carpet in a darker colour so as not to show so much dirt. 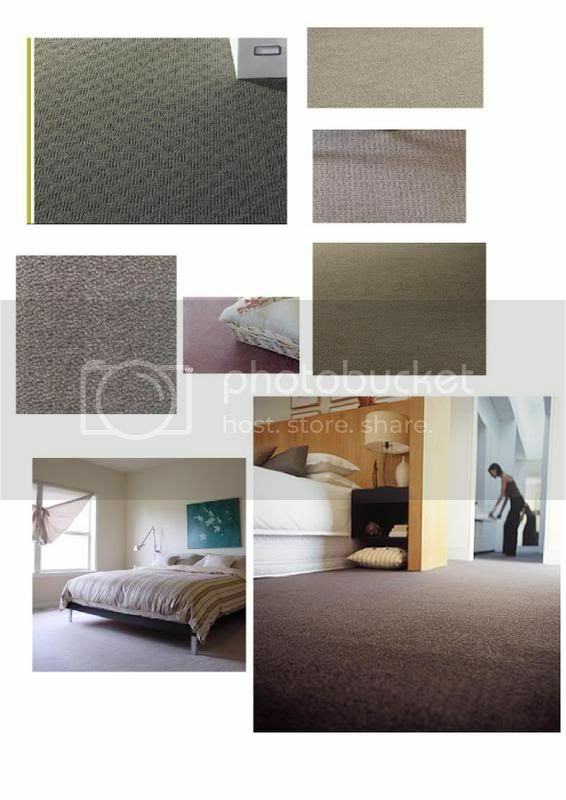 **Phoenix**, reconsider getting a dark carpet - we have a charcoal carpet and everything shows (by that I mean surface fluff, little specks of god knows what - not talking stains) - if I wasn't a nut for dark grey, I would be regretting it. Ash - how often do you recommend vacuuming a 100% wool carpet? If I remember in one of your posts you said better less than more? Thanks. I know this carpet; I left it for Ash thinking he would be able to help you. Victoria Carpets is a good brand…..you have chosen well! You can’t go wrong with a twist pile, they are very strong! 80/20 is a good mix….this carpet should last for quite some time. Ash’s advice about mats is also important. I didn’t want to be the one to tell you about all your dark selections kitchen, carpets…. Knowing how much you love grey, I don’t think it would have mattered what I said. But I’m sure it all looks great anyway……just keep the vacuum ready and the all purpose cleaner for the kitchen on hand. Thanks Mek, we don't want a dark charcoal or dark chocolate colour, but we do want something darker than cream. We have been looking at Moccha colours, so hopefully that will be a safe bet. Just rediscovered this. I read it b efore and was going to reply but got distracted by people playing funny-buggers! Brief response... the probs you had was probably nothing to do with the underlay. It's more to do with inefficient cleaning and/or maintenance. Mostly, its to do with residual chemicals from the carpet cleaning process. Cleaned properly, the carpet is left with little to no residuals, and any that may be left do not contribute to resoiling. Australian Standards and Woolsafe standards require that chemicals meet this criteria, but many (usually cheap) carpet cleaners load the carpet with poor quality chemicals that can cause problems.